Formed one half of a modern Asterix-Obelix homage duo with Justin Langer, aka the Nuggety Little Wozzie Legend. Cooks. Given to exuberant celebrations with opening partners, and sometimes, promiscuously, with those down the order as well. Is outdoorsy. Fishes. He's big, he's from Queensland, he spent time in the cricket wilderness, and he's not overly fond of Indian offspinners with turbans on. i.e. he's about one anger management session away from being Andrew Symonds. Scored 380 in a Test innings, hooked a 136kg marlin, is friends with Andrew Symonds. Not having learned how to walk into the sunset. Running triathlons, going fishing, giving the ball a good belt, and getting into the ring with Indian fast bowlers about half his age and a third his weight. A dog that attacked him and ripped a five-centimetre gash in his ankle in October 2006, a week after he broke a finger. "It was a vicious attack," Haydos declared, as he looked up the meaning of "irony" in the dictionary. Squatting at the wicket while taking strike and staring impassively down it while the world and its mother wishes he'd get up and get on with it. Given to performing a more protracted version of this ritual the day before a game, when he stops just short of pitching a tent and setting up a cooking stove on the good-length area. Haydos is actually a sensitive metrosexual at heart, as revealed by his fondness for cooking. Swept so well on the India tour of 2001, he was offered a job with one of the local municipal corporations. Ability to live with the essential paradox of being able to cross himself when he gets to a batting landmark and then sledge a blue streak in the next innings. Used to travel with a camping stove, frying pan, wok, bamboo steamer and food processor on tour, but kept the fruits of his culinary labours away from bowlers and such other low life-forms. 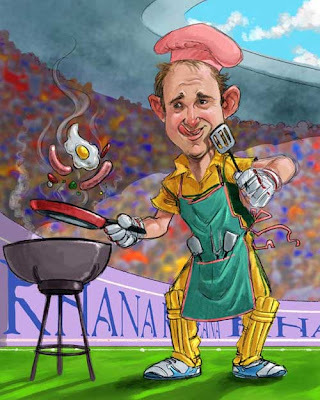 He is the author of a cookbook, cunningly called The Matthew Hayden Cookbook, and a sequel, called The Matthew Hayden Cookbook 2. Smoked ham and pumpkin soup. Grilled bowler with a side of desiccated fielder. Has changed headgear-colour preference of late - from green to orange. Doing a West Indian accent after having had a few at an ICC awards show.